Amy Khor : I Visited Coffeeshops During This Election Season So I Know What People Want, OK? The People’s Action Party’s (PAP) Amy Khor will defend her Hong Kah North seat in the coming General Election (GE). Dr Khor, 57, served as a Member of Parliament (MP) for Hong Kah Group Representation Constituency (GRC) from 2001. For the last GE in 2011, her ward was hived off as a Single Member Constituency (SMC). During the press conference, Dr Khor thanked residents for their support. “I’ve been going around on coffeeshop visits this election season. Many residents have asked me if I’m going to stand. I’ve made a pledge to complete all the projects I intended to do. 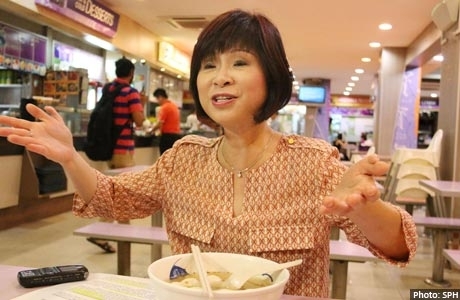 I hope residents can continue to give me their support for me to do my very best to improve their lives,” she said, whilst enjoying a $4.50 plate of mee goreng. Dr Khor is the Senior Minister of State for Health and for Manpower. At the last GE, she defeated Singapore People’s Party (SPP) candidate Sin Kek Tong with 70.61 per cent of the vote. This time, the SPP has declared it will contest the Hong Kah North seat once again.